“The white people are waiting for us. Chuck sees them first. He’s gone out ahead of our group to peer around the corner by the hardware store. From there you can see all of Jefferson High. The gleaming redbrick walls run forty feet high. The building is a block wide, and the windowpanes are spotless. A heavy concrete arch hangs over the two-storey wood-and-glass doors at the front entrance. And the only thing between us and the school is the parking lot. And the white people. It’s February 1959 and the doors of Jefferson High School have been unlocked, months later than they should have been. Despite the governors best efforts the court have ruled that the doors must open and remain open for the rest of the school year, even for the ten black students who are transferring there from the local black school. No one wants Sarah and her friends at the school, not Bo and his gang who try and make their lives a living hell from the minute they see them, and especially not Linda Hairston, the daughter of the towns most outspoke segregationist. Sarah and Linda have every reason to hate one another but when a school project forces them to spend time together they learn very quickly that everything is not so black and white, especially not their feelings. As both girls start to feel something they have never felt before they both try and push it down and ignore that feeling as much as possible. Its one thing to be frightened by the world at large, but its another altogether when you’re terrified of what you feel inside. This book offers a roller coaster of emotions and difficult events which make you fell physically sick. It is not a nice book but it is an incredible one and one that I think should have pride of place within any school library to help young adults understand just how dangerous narrow minded thinking can be. Lies We Tell Ourselves is about two girls. Its told from both of their perspectives but its not until quite far into the book that you start getting the second perspective. I loved the way the book was split up between Sarah and Linda and how much that helped you understand the characters and their actions. The first part is told from Sarah’s point of view and shares a bit about why her and the other black kids in her group are doing what they are doing. Its about how they are treated on their first days at Jefferson High and how they are meant to deal with that. Its harrowing and unnerving and most of all just plain shocking. Then you get Lindas point of view. I didn’t think I could be any more uncomfortable reading this book until I got to the second part. Its almost like Linda has been brainwashed into a certain way of thinking by her father and every other white person. She actually believes what she is saying but its like she’s just constantly repeated what others have said in front of her and its terrifying. Its not until she starts to get Sarah arguing back that she begins to realise, just a little bit, that these things are wrong. But then singles Sarah out as an odd one out and claims that she is just a ‘different’ black person to all the others. Theres a lot of this book that scared me. The way black people were treated, the way women were treated an the fact that the events were based on fact. This type of thing did go on in the ;ate 50s and early 60s and the scariest thing about it is that it really wasn’t that long ago! The talk of ‘black bathrooms’ and the fact that some shops wouldn’t allow black people to even step through the door, its horrible. No one should be mistreated like that and the worst thing about it was that people just let it happen because the higher powers, those like Linda’s father, told them thats how it was. The events of this book were awful but they were the truth and we have to hear about these things to remind us not to be so narrow minded and judgemental – its never right. I loved this book, its definitely a five star book for me. The writing was exceptional engaging, I love the social commentary it provides about the time these girls grew up in. I loved how sexuality was brought into it and how it constantly reminds us that nothing – race, gender, sexuality – should stand in our way of our goals. 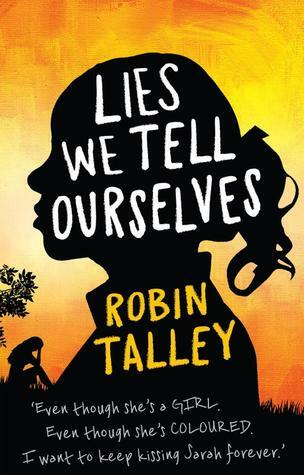 Fantastic job Robin Talley, I cant wait to read more of your stuff! Lies We Tell Ourselves was published on 3rd October. My copy was sent from the publisher in exchange for an honest review. Ahh I just read this for Emma, I didn’t think I was going to like it as I thought it was going to try and be too many things to too many people – I was SO wrong!